I am officially on vacation but feeling a little down in the dumps. Today is my dad's birthday and four days from now is the anniversary of my mom's death. My birthday is right in the middle but I never feel much like celebrating it anymore. I think it's the winter too, and the promise of spring all conspiring against me. I am hoping to counteract some of the sadness by having a sisters weekend. My two sisters, Katie and Sheila and my "sister of the heart" Jackie, have been talking about doing this for a while. Katie's best friend from college tried to arrange it at her place last year but we could never coordinate. So this year we are having it here at the farm. I just need to get everyone up here before the weather gets too bad. Jackie had to cancel at the last minute, but she may come up one of the other weekends. Let's just hope these girls keep me laughing! 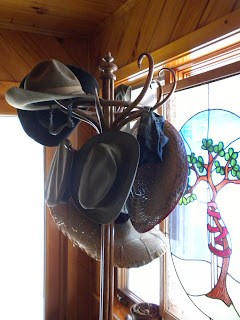 The hat stand is David's, at the farm. The stained glass window of the tree in a splint used to hang in the front door to his office. He was an orthopedic surgeon. Some of my followers will remember my cousin Kimmy, who died of breast cancer, and may even remember the sombrero story. Kimmy had lost her hair and we were all going to lunch so we all agreed to wear a hat. I showed up in the sombrero, walked down the street in it even. The look on Kim's face was so worth it. She and her mom couldn't stop laughing. I got some funny looks since I was wearing it in an Irish pub, but I really didn't care. I guess my sentimental Irish side is showing today. Hugs, dear and, I hope that your sisters weekend comes together, and that you all have a fine old time.